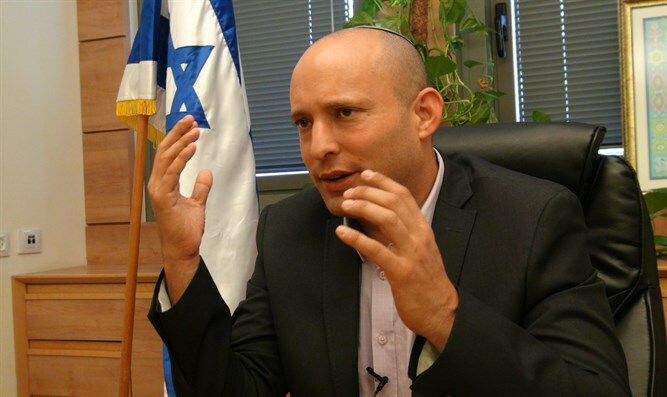 Education Minister and Security Cabinet member Naftali Bennett (Jewish Home) on Thursday slammed Israeli Prime Minister Binyamin Netanyahu for removing the magnetometers and security devices from the Temple Mount. "This is a very painful and upsetting morning," Bennett told Israel's Army Radio. "Israel has come out of this crisis considerably weakened. Instead of strengthening our sovereignty in Jerusalem, we sent a message that our sovereignty can be appealed - not just on the Temple Mount, but in other areas as well." "The decision to remove the magnetometers was definitely the wrong decision. Israel came out of the whole issue weaker. I worked determinedly to convince the Cabinet not to give in, that we cannot afford to give in. Every time Israel bows to strategic pressure, it harms us in the long run. It harms our ability to deter attacks. "I expect to see an increase in violence in the next few weeks. We live in the toughest neighborhood in the world. When they smell weakness, they hold their heads high. We need to take all plans for helping Palestinians and giving them 'carrots' off the table, and put in their place plans for operations which will end terror." On Tuesday, Israel's Supreme Court ordered the bodies of the Temple Mount terrorists returned to their families within 30 hours - despite the fact that Hamas still holds captive the bodies of two IDF soldiers who fell during 2014's Operation Protective Edge. According to the Supreme Court, "Israel Police can set conditions and instructions according to what it believes will ensure the terrorists' funerals are properly secured and in order to prevent violent outbreaks." Meanwhile, Bennett told the Army Radio that he opposed the decision to return the terrorists' bodies to their families. "Umm al-Fahm residents tried to organize a protest. Sixty people showed up. The moment they realized we caved to their demands, thousands of people showed up for the protest," Bennett said. "When we stand strong, they tip their hats to us. When we retreat, they lift their heads. We need to enact laws which will overcome the Supreme Court's decisions in these matters."